Last night, we had an adults-only feastathon (if you can call a selection of small plates a feast) at Sumo Mayo, so today, we figured we’d take the kids-along. Plus, we woke up late, I didn’t cook breakfast, and well – I don’t need to explain to you why I wanted to go to brunch. Anyway, we hit up Chelsea’s Kitchen, a super cute spot in the Arcadia area. The weather was nice, so we went to the patio, which was bustling. I never use the word bustling, but it totally fits here. Since it took us 30 minutes of kid-poking, kid-singing, and overall kid-annoyingness to get there, me and the hubby ordered a pitcher of white sangria (their menu calls it the best in town) as soon as we sat down. We also ordered the kids what they requested – a fresh fish plate for the Big and pancakes for the Little. Couldn’t get the best pic with the shade, but I had the short rib hash. The kids ate their food too quickly for a photo. 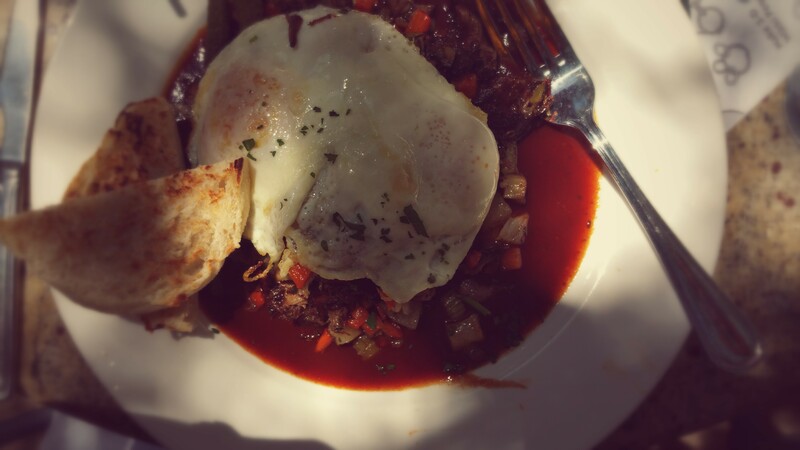 We ordered the short rib hash and a special baked eggs dish, respectively. Instead of the typical coloring sheet and Crayons, Chelsea’s Kitchen had some sort of waxy, play straws for the kids to play with, which was a pretty good distraction while we perused the menu and waited for our dishes. The food came quickly, the sangria flowed and the boys dug in. Both kids’ plates came with fresh fruit; the fish was a small portion of grilled (but unnamed) fish while the pancakes were light and lemony. Both adult plates were hearty and sufficiently rich enough to justify downing the entire pitcher of sangrias. Kid-friendliness: They had a kids’ menu and highchairs/booster seat, although we weren’t offered the highchair. Note: Even though they had a kids’ menu, drinks weren’t included and options were OJ, cranberry juice or soda. Bring a juice box.